MoBro for Sho! Show some love! I know its been awhile since my last post, but its been a tough couple of days. A lot going on. BUT… here’s to a fresh start. With Novembers arrival, the time has come for creepy guys to become even creeper. The month of Movember. Time for men to grow dirty facial hair and bring awareness to a much needed cause. My hubblicious has joined again this year and we started with a plan, unlike last time. We’re going with “The Trucker” or “Handlebars” as some others like to call it. Kinda scary as were only 5 days in but the shape is there and growing in like a champ! So today, I’m reaching out to all of you to support my husband. Even $10 would make a huge difference. 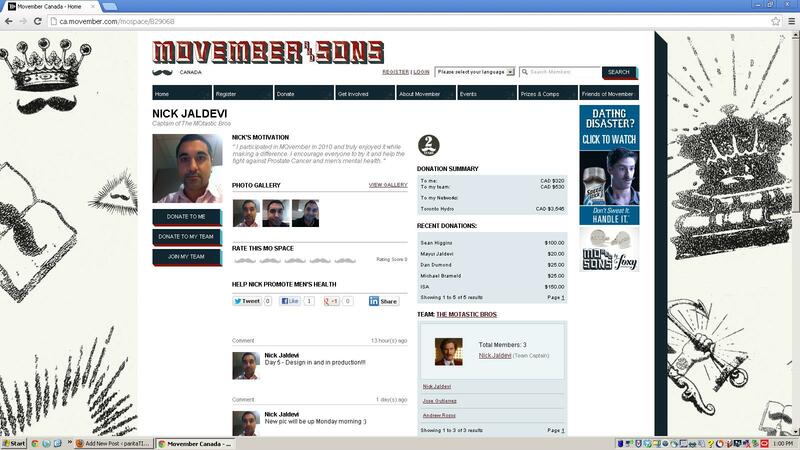 Its easy to donate, just go to http://mobro.co/nickjaldevi and right under my dashing young husbands picture is a link that says Donate to Me. Click on that and its all easy peezy from there! To all the MoBros out there, hats off to you for supporting a great cause. I wish you a big and hairy moustache!!! Sending lots of love out there! Next Post What happened to me?!? !